A lawn care plan is not complete without lawn fertilization in Papillion. With constant changes in the weather, watering is not enough to maintain your grass. It needs excellent fertilizers to stay in great shape. To prevent your grass from turning dry and dull, opt for lawn fertilization in Papillion. At Heroes Lawn and Landscape, every lawn care procedure is carefully designed to meet the needs of our clients. Our services bring value and beauty to your property by investing in stellar equipment and trained applicators. If you want exceptional lawn fertilization performed on your property, consider us fit for the job. You can try fertilizing your grass, but lawn fertilization in Papillion is still best left to the professionals. That’s because grass can be picky. If you treat it with the wrong fertilizer, it may end up hurt instead of improved. If you perform lawn fertilization in Papillion on your own, desired results are not guaranteed. You may even accidentally hurt your grass. When this happens, your turf could take a long time to heal. In addition to the wasted time, you will have to shoulder more expenses for the recovery. You can avoid these with professional lawn fertilization in Papillion. Between guesswork and professional service, the latter always wins. When you hire our specialist in lawn fertilization in Papillion, expect safe and tested solutions for your lawn care needs. Lawn fertilization in Papillion can be expensive. It requires the right tools, chemicals, and other products for lawn care. If you already have these in your tool shed, that’s good news. If you don’t, you’ll learn that hiring our provider of lawn fertilization in Papillion is cheaper. When you opt for professional lawn fertilization in Papillion, you’re not just spared from worrying about equipment. You’re also delivered our extraordinary services that’s honed by years of experience and training. Professional Lawn Fertilization in Papillion Saves You From Exhaustion. Lawn fertilization in Papillion requires hard work. These landscaping services can also come with back or muscle pain, fatigue, and sunburn. For elderly homeowners, this is not advisable. Luckily, you can leave the physical labor to landscaping specialists of lawn fertilization in Papillion, Nebraska. This gives you more time for family and relaxation. If you choose our landscaping services for lawn fertilization in Papillion, you can keep your grass healthy without lifting a finger. A green and healthy lawn is a reflection of great home maintenance. It makes your property more attractive to house buyers. As a result, your home’s market value increases. To have thick and lush turf, consider lawn fertilization in Papillion, Nebraska performed by Heroes Lawn and Landscape. The first treatment occurs in spring. Pre-emergent weed control with fertilizer and broadleaf weed control will be applied on your lawn during this time. We’ll perform another treatment before summer starts. 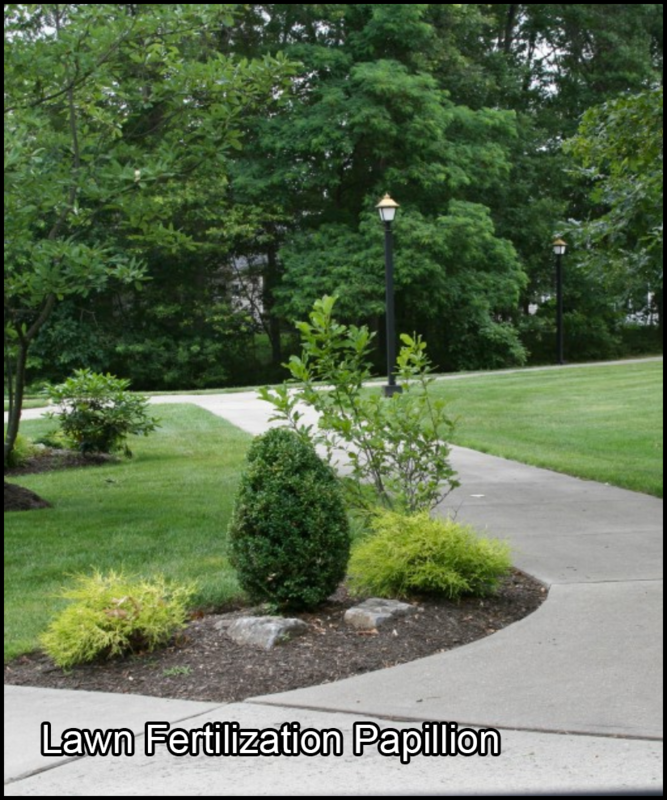 We’ll use the same lawn care solutions: pre-emergent weed control with fertilizer and broadleaf weed control. Summer can cause great stress to your lawn. We’ll prevent this by treating your grass with summer fertilizer, grub control, and broadleaf weed control. We’ll feed your grass with macronutrients and use broadleaf weed control in autumn. In winter, we’ll treat your grass with a winterizing fertilizer and broadleaf control. Heroes Lawn and Landscape is a company that brings new meaning to the term, “full-service.” We are much more than just a landscaping services company. Apart from landscape design, we also offer lawn care, lawn maintenance, mosquito control, and holiday lighting services. We know how tedious it is to have to hire different companies to handle all home care aspects of landscaping, lawn care, and outdoor lighting. Our landscaping goal is to save our clients time and energy by providing a one-stop solution to all of their outdoor improvement and maintenance needs. Our services can turn a humble backyard into an outdoor entertainment area by installing a custom-designed patio, and make hard-to-reach outdoor areas more accessible by constructing garden paths. By installing hardscapes such as retaining walls and steps, we can make your lawn or yard more functional and visually appealing.